Not’ta Snow Balls Chance wins the 2014 Invitational Championship! Not’ta Snow Balls Chance with many well wishers! Many thanks to our important sponsor Tri-Tronics! 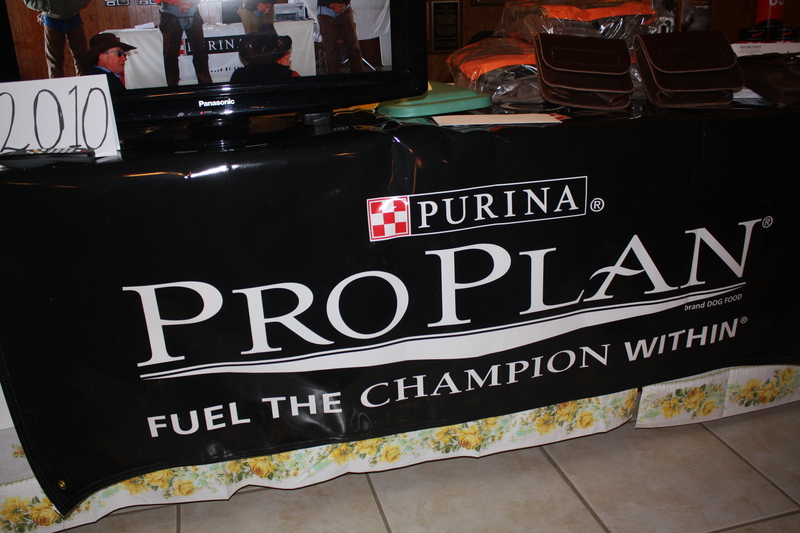 We couldn’t do it without our beloved Purina!
! !ANOTHER HIT PRODUCTION OF THE USSDI CHAMPIONSHIP!! NOT’TA SNOW BALLS CHANCE STEALS THE SHOW IN 2014! 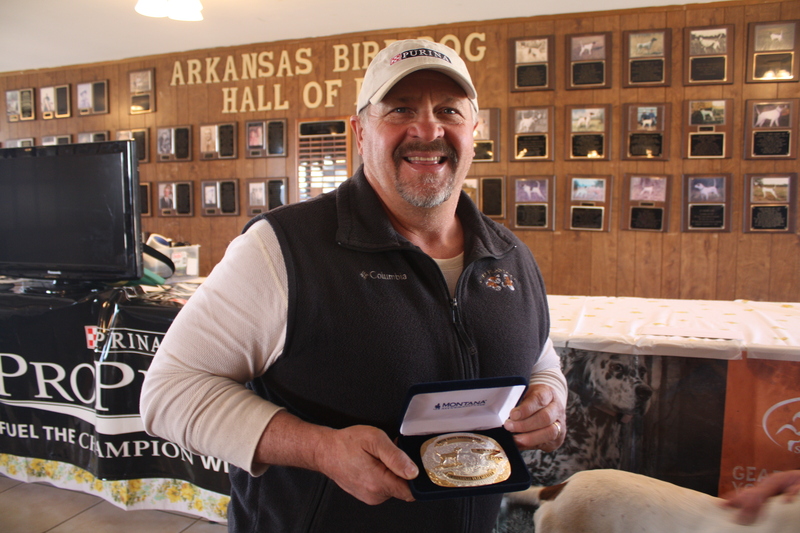 After three days of competition on Camp Robinson Wildlife Management Area, Rex Garner’s Not’ta Snow Balls Chance claimed the 2014 USSDI Championship for handler Stacy Perkins. 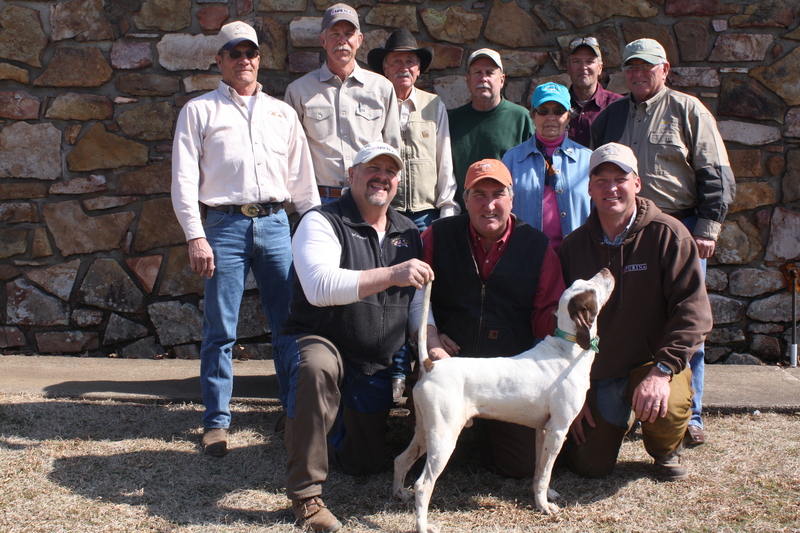 There were 12 of the top shooting dogs in current competition all vying for the coveted title. Owner Garner’s good friend, Francis Buche of Pittsburg, Kansas bred his female, Buche’s Elhew Cassie to Lester’s Snowatch in 2010. Garner acquired “Tim” and the entire litter from Buche when the pups were 10-weeks old. Garner gave him his early training in South Dakota and competed with him as a derby. Tim’s first win came as a derby in Missouri with Perkins scouting for Garner. In that appearance, the young dog had an impressive five finds. He was placed with Perkins who has taken him in his string to South Dakota for two summers. 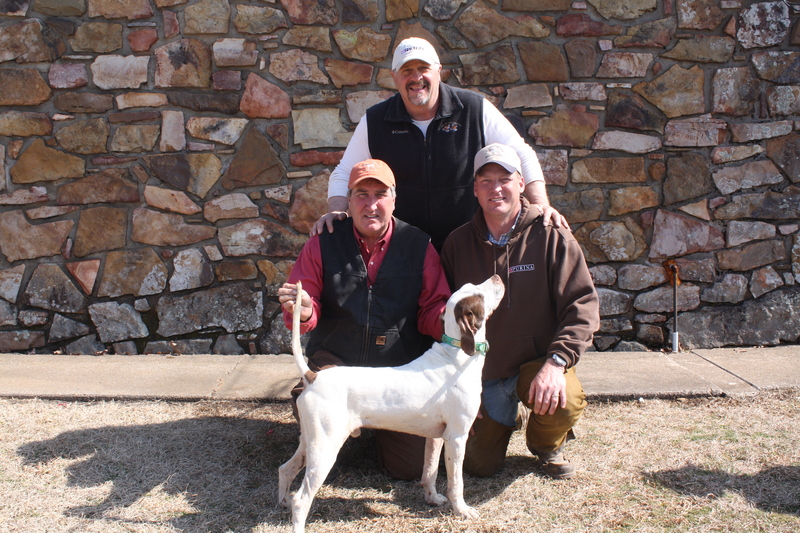 To qualify in this year’s Invitational, the good-looking white and liver pointer was named Champion of the Illinois, the Missouri and runner-up in the Atlantic Coast Shooting Dog Championships last season. Not’ta Snow Balls Chance appeared in the last brace on Saturday, showing a good forward race and having one solid find. In the second brace on Sunday, he had two mannerly stops to flush with a smooth, consistent race to the front. In the finale, “Tim” continued to exhibit a strong, wise effort on the ground and was rewarded with a steady, stylish find at one hour ten minutes. It is quite an accomplishment to put a trial of this magnitude together and arrange that it all comes off smoothly. 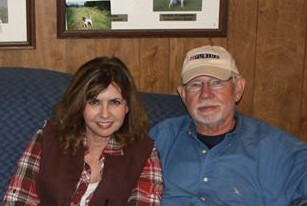 Johnny and Joyce Taylor, along with Johnny and Rita Ornsby manage to do it each year. No detail is overlooked; everyone is made to feel as special as they are, to be invited to this competition. As Johnny Taylor said, “Everyone who is invited is ALREADY a WINNER!” And behind the scenes are many who assist in various ways. Connie Crowell daily helps organize and serve the cocktail hour and evening meals. Connie, Joyce and Rita also skillfully handle the marshaling duties, the best-looking marshals you will ever see, I would wager. After the first brace each morning, the ladies serve hot coffee, water and soft drinks sweetened up with homemade breads and bars. J. D. Smith and Mike Taylor assisted Chef Johnny O. at the grill. Janice Stroud prepares and serves her delectable home-style cooking for the lunch bunch each day. Although semi-retired, she is still the BEST!! From photos, to lunches, to gifts and prizes galore, it is an amazing feat they pull off and all with the utmost CLASS! 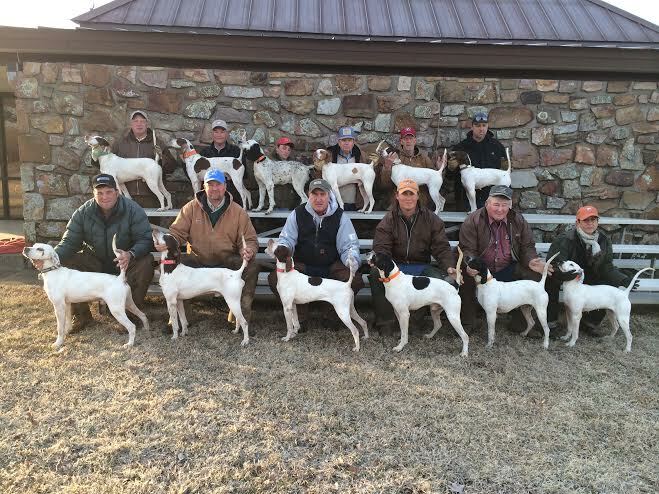 The format of the Invitational is three consecutive days of competition for twelve of the top dogs in last season’s Purina Top Shooting Dog standings. In the first two days, each contender runs a one hour brace. At the end of the two days, the judges choose worthy dogs to be called back for a 90 minute championship brace. The Invitational is held on the Camp Robinson WMA near Conway, Arkansas. One of the premier venues in the field trial world, it is very well tended by Roger Martin and his staff, Josh Fortner and Larry Martin. Even after the period of drought the area has suffered, there was ample cover and food for the quail. Forty-five hundred quail had been released over the courses; twenty-five hundred in September and another two thousand in late October. One hundred feeders are strategically placed and filled weekly by the crew. Camp Robinson has all the amenities of a first-rate field trial site. A sixty-stall horse barn sits near the lower parking area plus nine round corrals that will comfortably hold one or two horses. There are two separate fifty-dog kennels, one on each side of the barn and a forty-dog kennel at the upper area. A large corral is located at the upper barn, allocated for the judges. Pads for washing horses are situated in three areas. A large section is designated for campers and RVs with electricity and water hook-ups. The camping area was full to the brim, it might be noted. Thanks to Roger, Josh and Larry for all the work they do for us, not the least is the shuttling of dogs at the right time and right place! Special gratitude goes to the kind benefactors of the Invitational: Audrey, Jack and Brian Sanchez, Charlie and Linda Jackson, Randy and Lynn Potter, Johnny and Joyce Taylor, and the late Lee Cruse. Their contributions through the years have made it possible for a $7500 purse to be guaranteed to the winner. There is an astounding group of sponsors involved with this trial. Gifts and prizes, donated by the generous sponsors are handed out to the participants on each of three nights. First and foremost is Purina (Ross Young oil painting to the winning owner, dog food to the winner and each handler entered). Many thanks to Pat Lamantia, Roy Pelton and Purina. We couldn’t do it without them. Other supporting sponsors are Garmin (Astro units), Sport DOG (training collar, no bark collar, bags, beeper and training system, canine supplements, wax-coated caps), Tri-tronics (training collar), Rita Ornsby (wood art/sculptures, wood carving trays), Johnny Kirtley (wooden dog wall hanging, wood quail), Haggis Saddle Company (saddle bag), Heskett Saddle works (saddle bag), Collar Clinic (repair certificate), Nancy Whitehead Sporting Dog Photography (sport dog book, sport dog date book), Tucker Saddlery (bridles, breast straps), Wilcox Feed (buckets, feed tubs, feed scoops), Leather Brothers (collar with nameplate), Gordon and Cindy Hazelwood (Montana Silversmith belt buckle), Gun Dog Supply (gift certificates), Spalding Labs (fly predators certificates, Bye Bye Odors), Connie and Art Crowell and Purina(caps), Ron Prewitt, Don and Ginger Kidd, Witt and Carol Stephens, Dr. Jeff and Melanie Hale and Farmers Association. Each handler and owner, judges and reporter received shirts and caps sporting the USSDIC logo. Stepping away from the usual pro-am judge format, the gentlemen who were asked to officiate were both professional trainers. 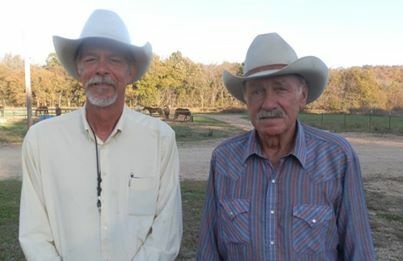 Virgil Moore of Canyon, Texas and Jack Herriage, Bradford, Arkansas each compete on the major shooting dog circuit and incidentally scout for each other. The men have quite a bit of experience in training, competing and judging along with their familiarity in the responsibility of running a trial. They were compatible in their analyses of the performances. Appearing on the Camp Robinson stage were twelve of the very best shooting dogs, competing in the United States at the present time. The “cast” convened from across the nation, representing California, Pennsylvania, Oklahoma, Kentucky, Illinois, Tennessee, Arkansas, Kansas, New York, North Dakota, Mississippi, Florida, Virginia and Michigan. You might say that is a cross-section of the states but it was interesting to realize that seven of the twelve dogs in contention were trained/handled by descendants of Mr. Gerald Tracy. Mr. Gerald is a legend in his own right in the field trial fraternity. It is certain he would be proud of what his offspring are accomplishing. Ever important is a good scout, one who learns and knows the course, has a sharp eye, is an adept horseman and thinks like a dog. 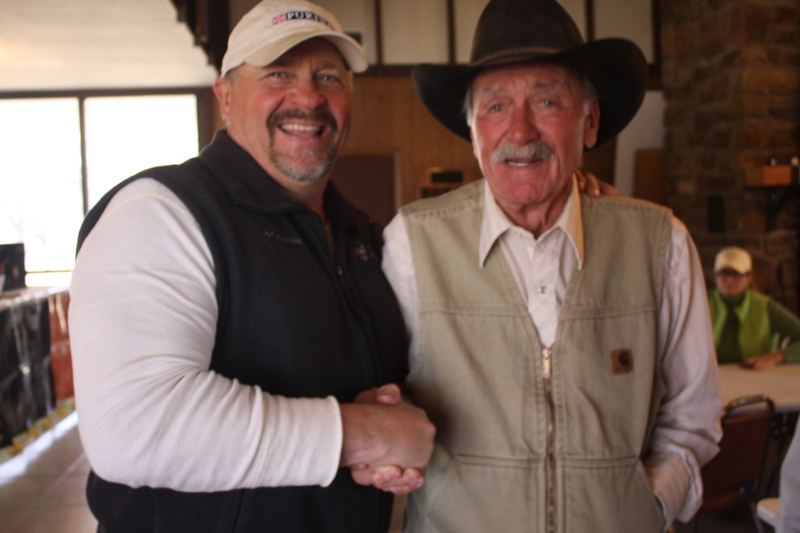 The involved trainers were lucky to have working for them in that capacity, the likes of John “Buzz” Daugherty, Steve Messick, Eddy Taylor, Harold Woodward, Bill Kerr, Mike and George Tracy. The winner, Not’ta Snow Balls Chance had his own delegation supporting his bid for the title. Friends from Kansas were on hand to support owner Rex Garner and cheer the dog on; it appears to have worked. Francis Buche, Mike Deplue, Steve Armstrong, Bill Cignetti were either on horseback or in the road gallery each day. Angela Perkins rooted for her favorite, too. 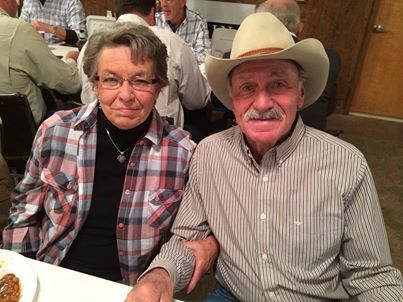 Madison McDonald rode each day for her grandfather’s dogs, Erin’s War Creek and High Drive Rocky (Linder). Jack Sanchez was in the saddle to watch Great River Ice and Great River Class. Bill Sand cheered on Hot Topic as did Gary Young for his Sammy’s Deduction. Donna and Jeff Ruth were saddled each day for Avalon Creek. 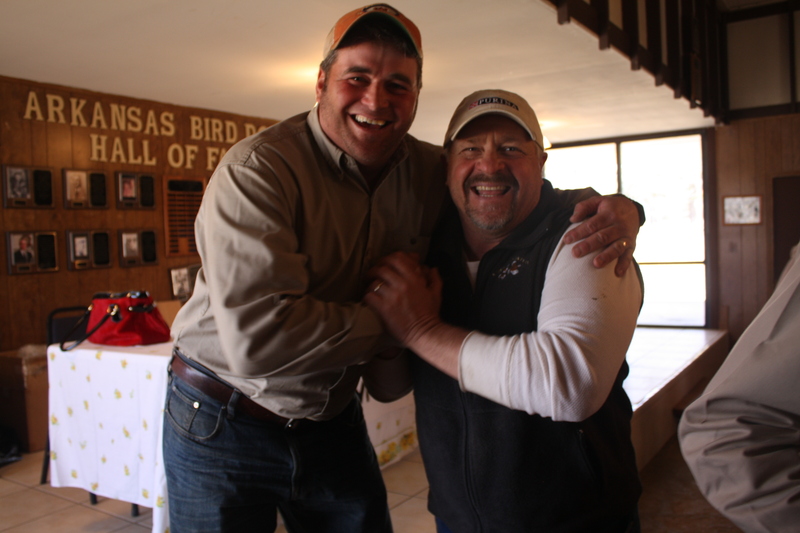 Others supporting the contestants were David Dosch, Harold Woodward, Art Crowell, Les Rowell, Johnny Ornsby, Jill and J. D. Smith, Shannon Nuckles, Mike Taylor, Marcia O’Neal, Cindy Finley, Jim Baker, Ronnie Miller, Jon Davis, Johnny VanHorn, Liz Daugherty, and Kate Dickson. Last but not least in importance, was Claudia McNamee from New York who rode each day. She and her husband, Bill had a dog qualified to run here last year and tragically, Bill suddenly passed away just days prior to the trial. Once again, she had her dog, Richfield Silver Belle invited this year. Due to some health issues, the decision was made to retire Belle. Wisely, Claudia came on anyway and brightened up the gallery each day. She promises to return. Allen and Sandra Linder, Mary Tracy, Jim Darnell and Purina rep Roy Pelton followed the activities in the road gallery. Sunday was a pleasantly warm, sunny day and there were 39 counted in the saddle. Saddle Up Non Believers (Kelly) and Great River Ice (M. Tracy) were away at 8:05 at the morning breakaway. Believer was found on point on the left at the first turn. Nothing was raised for her. She continued on to be found standing again at 16 with Ice backing. Flush produced nothing. Another nonproductive at 41, followed by a well-located, mannerly find at 48 on the left side. At 52, Believer pointed once more and a rabbit was shown. Ice had no bird work in this first brace but ran a forward, showy race, probably the best seen all day. 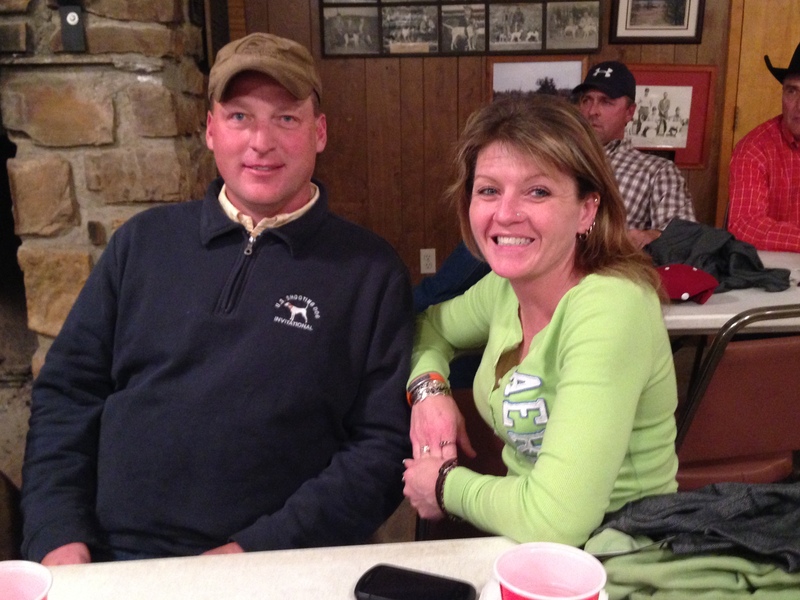 Calico’s Touch of Class (G. Tracy) and Covey Rise’s Offlee Amazin (Kinkelaar) were away at 9:23. At 10 at dead horse curve, Class had a point, birds were put in the air, all in order. Released, she cast forward, scented birds, went back and forth, then pointed. Handler could not get anything up and asked her to relocate. About 40 yards, she established point again in a bi-color patch. Handler called flight of one bird which was not seen officially. Amazin rendered a nice showy ground pattern but was gone at 22, not to return in the hour. Erin’s War Creek (G. Tracy) and Hot Topic (Kinkelaar) broke away before the nursery pond. War Creek made the loop around the lake, across the gravel road and established point at 12. Very pretty on point, an excellent find. Continued to move forward across the country, attuned to the handler. Perhaps the best dog of the morning. At 36, both dogs were standing after the rabbit pens before going over the hill, Hot Topic in the backing position. Tracy flushed for War Creek to no avail. Hot Topic hunted the country in a good effort but no game this morning. Sammy’s Deduction (Hazelwood) and Avalon Creek (M. Tracy) were released at the afternoon breakaway at 1:26. Avalon was gone at 16 and not returned to judgment. Sammy ran a smooth pattern, not to the extreme and chalked up a nice find at 53. He showed good style and manners. Grand Heritage Motion (J. Tracy) cast forward at 2:37 and out of sight. The call of “point” was heard at 10. A long ride followed to the dog. Most likely the best find of the trial. Birds were flushed, all in order. High Drive Rocky (G. Tracy) had a stand at 8 but nothing was produced. He disappeared at 17 and was not located during the hour. Motion continued with a forward race, handling well. At 49, “Moe” was found on point again, far to the front. He finished the hour with no further bird work. Not’ta Snow Balls Chance (Perkins) and Great River Class (G. Tracy) were loosed in Seawright’s Cut. Snow Ball ran a good forward race, making some nice showy casts. He was rewarded with a nice find at 27. Class had an independent stand at 27 but handler was unable to raise birds. Point was called for Class at 58. Handler asked the judge if he saw a bird leave and the answer was negative. She seemed lax in posture but handler flushed a covey for her, everything was okay. Point was called for Snow Ball after time was up. According to the rules of the Invitational, the judges did not go to the find. Great River Class (G. Tracy) and Grand Heritage Motion (J. Tracy) were braced together the second day. Daughter against Father. A sunny, warmer day with 39 counted in the morning gallery. Motion ran a nice race, even stronger than the first day. 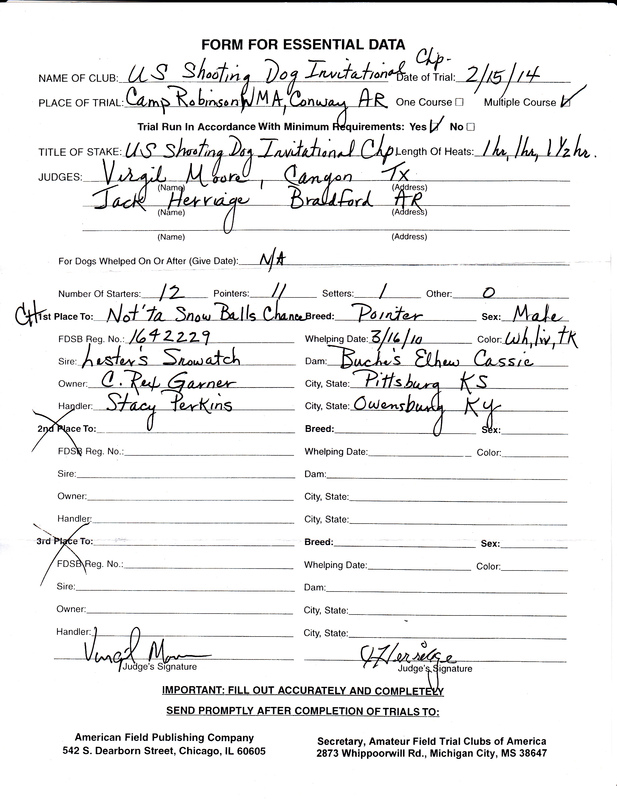 The scout, Bill Kerr found Moe on point at 16 and there was a lengthy wait for handler and judge to arrive. The dog stood staunchly and politely. Handler flushed birds and continued on. The dog was not seen for about 8 minutes but showed up dead to the front. At 32, both dogs were standing. Handlers flushed but only an armadillo was shown. Class was pointing at 47, birds produced, all in order. Breakaway at 9:15, Not’ta Snow Balls Chance (Perkins) and Avalon Creek (M. Tracy). Avalon had a stop to flush at 8 at dead horse curve. She followed with a covey find at 28 and another find on a single at 30. At 32, she had an unproductive in the same vicinity. She was gone from judgment at 40. Before the nursery pond, birds were seen in the air and Snow Ball was stopped at 48, a good stop to flush. Both judges were looking at 58, when birds boiled up on the lake’s edge and the dog immediately stopped. As handler went in front, even more birds came up. A true, mannerly stop to flush. His overall race was smooth and to the front. High Drive Rocky (G. Tracy) is a very attractive moving dog but not enough was seen of him on this day. He had no bird work in the first half and was gone at 30. Sammy’s Deduction (Hazelwood) ran a moderate race and had a stop to flush at 49. Handler called flight of birds which were seen officially. The dog indicated that birds were gone. When handler went out front, the dog tightened up again. Handler fired shot and as he walked back to the dog, another bird came up. Erin’s War Creek (G. Tracy) and Saddle Up Non Believers (Kelly) were away at 1:29 on a sunny, mid-sixty-ish afternoon. Saddle Up had a non-productive at 5 with War Creek backing. War Creek did not please his handler on this outing and was taken up at 30 with no finds to his credit. At 34, Saddle Up suffered a second unproductive and was picked up at 35. Great River Ice (M. Tracy) had a great effort on the ground and was found on point at 28, dead to the front. Tracy attempted to flush to no avail. He tapped the dog on the head and he moved forward. When birds came up, he erred and his day was ended. Going up the mountain, Covey Rise’s Offlee Amazin (Kinkelaar) established point at 30. Nothing was produced and he was asked to relocate. He handled the relocation well, birds were flushed, all in order. lit out at 3:35. Both females ran great races in this last brace. At 19, Class was standing with Topic backing her. Birds were kicked up, all in order, dogs taken on. Handler called point for Class again at 27 with brace mate backing again. Handler said he saw an armadillo but proceeded to flush and nothing was put up. Both finished the hour with no further game contact. Both Not’ta Snow Balls Chance (Perkins) and Grand Heritage Motion (J. Tracy) showed strength and enthusiasm at the onset. Motion disappeared out the front end at 3 and was not gathered again until 33. He came back in showing determination and endurance although his feet were rather raw. He showed a lot of endurance throughout even though at times, his feet hindered his range. Snow Ball continued to hunt and run strong but had no game until 1 hour 10 minutes when brace mate’s scout, Bill Kerr called point for him. The dog was standing with beautiful style in a ditch near a thicket. Handler went in and birds came up everywhere. Shot was fired and the dog stood with proper etiquette. At 1 hour 17, point was called for Motion. Snow Ball was in the area and was whoaed by handler. Both dogs stood there for a lengthy flushing attempt but nothing was shown. Snow Ball is a very powerful running dog with loads of endurance. He never showed any signs of weakness except when he was stepped on by a horse in the gallery after Moe‘s unproductive. He yelped and showed a couple of seconds of pain. Scout attended to the setter’s feet whose pads were gone and the pair continued on with business. They got to the mountain at 1 hour 26 where they were watered and sent on. Both pointer and setter finished the ninety minutes, with the pointer at a greater distance. The judges felt that in Snow Balls’ three day overall performance, they had seen championship quality. The decision was made not to look at the two standby dogs and the riders set out for the clubhouse and the announcement. 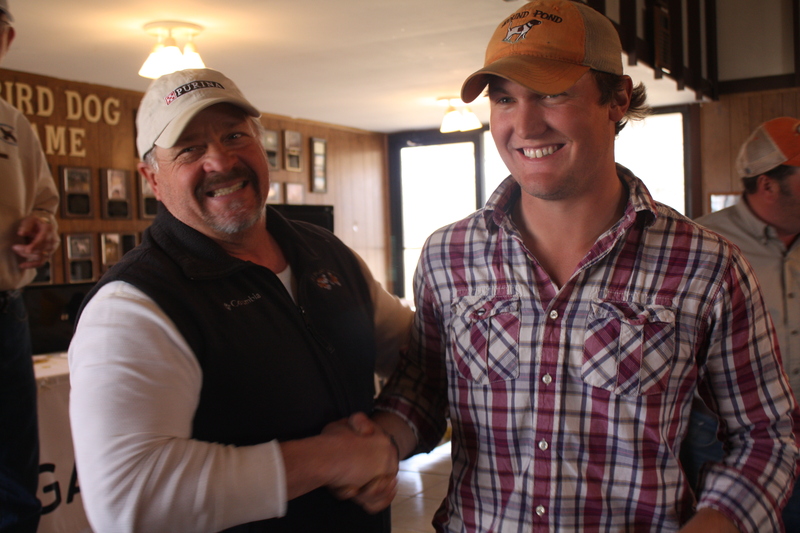 And the curtain came down on the hit show, the 2014 presentation of the US Shooting Dog Invitational Championship! The crowd from far and wide gathered in the clubhouse Friday evening February 14th. The cocktail bar was set up, thanks to Don and Ginger Kidd who were on hand. A delicious barbeque dinner with all the trimmings was sponsored by Witt and Carol Stephens. 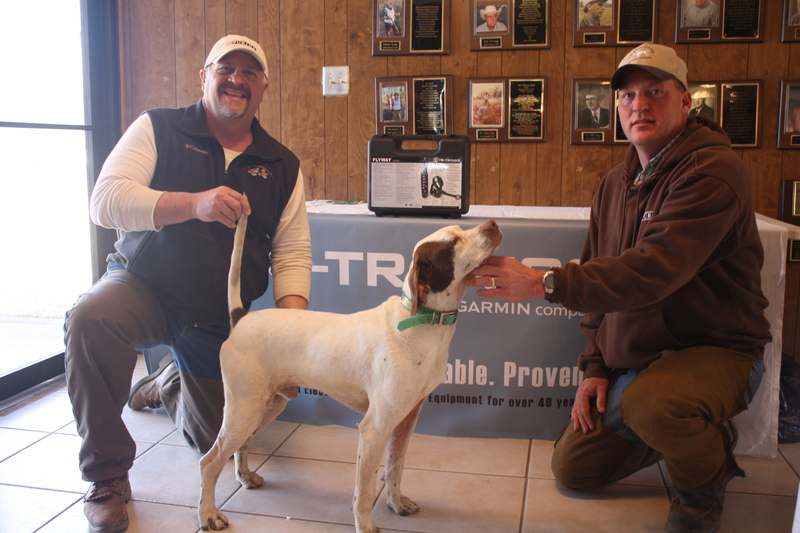 All handlers and owners were introduced and each entity received prizes (shirts, caps, Purina dog food and leather collar). 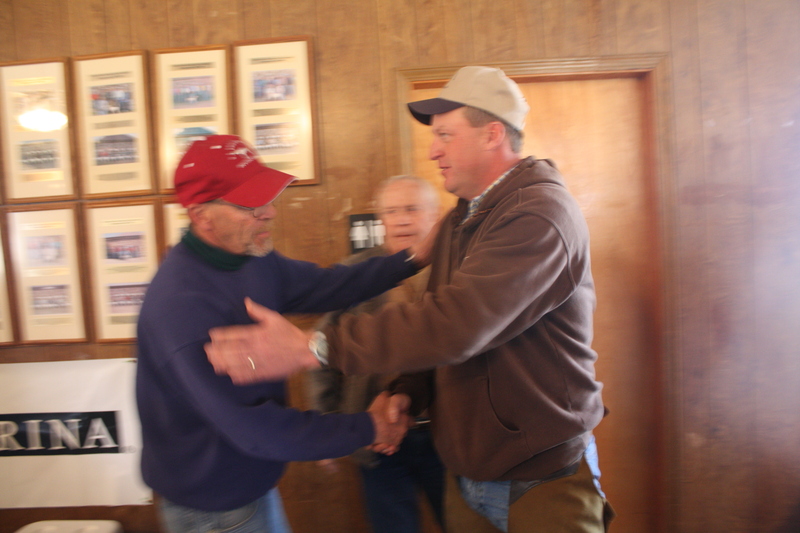 The judges and reporter were recognized and presented with gifts (shirts, caps, certificates). The drawing was held, pairing the dogs on a different course, time of day and brace mate for the second day’s running. 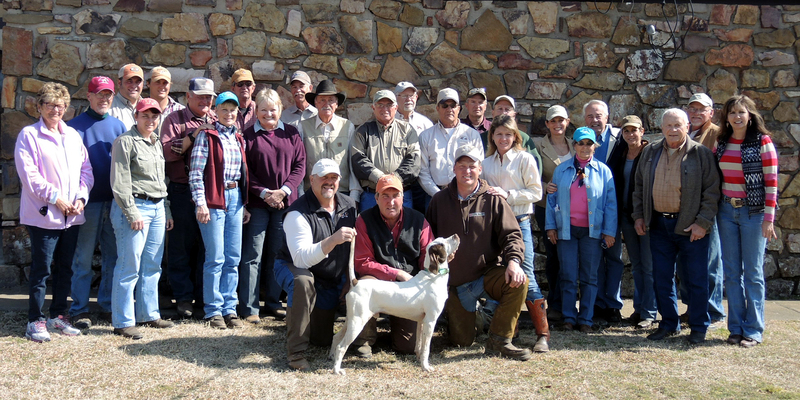 Saturday morning, the entire group met at the clubhouse at 7:30 for the annual group picture of the twelve dogs, handlers and owners. Joyce does an admirable job of getting that many people organized and I saw her get her whip only one time. The first brace took off at 8:05. On Saturday evening the club hosted a cocktail hour with a spread of appetizers and libations followed by a catered catfish and chicken dinner and desserts. After the feast, Jack Sanchez received a distinctive Ross Young oil painting presented by Purina’s Roy Pelton, a unique depiction of the 2013 Invitational Champion, Sanchez’ Great River Ice. Mr. Sanchez also received from artist Rita Ornsby a beautiful wood carving/sculpture of Ice. There was a drawing where each handler and judge received various items. Many other prizes were handed out to participants during the evening. Sunday night was THE big event, the one everyone had worked and waited for with anticipation. The night the judges announced the dogs which they wanted to see in the Callback. But we had to wait for that moment. 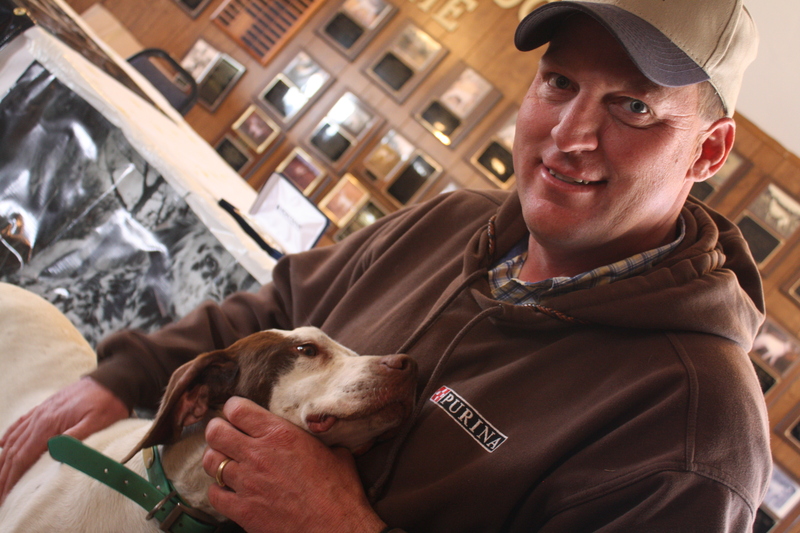 Jack Sanchez (Great River Kennels) hosted the happy hour and steak dinner, Chef Johnny Ornsby presiding at the grills…. with Mike Taylor and J. D. Smith assisting. Delicious steaks with all the extras were feasted upon, finished off with a beautiful decorated cake in honor of CH. Great River Ice. There were more prizes awaiting the handlers and owners: saddle bags, training collars, wood carvings. And finally the chosen dogs were revealed. In the callback Monday morning, the judges wanted to see Not’ta Snow Balls Chance (Stacy Perkins) and Grand Heritage Motion (Jeannette Tracy) and on standby were Sammy’s Deduction (Gordon Hazelwood) and Great River Class (George Tracy). To view additional photos from the 2014 Invitational Championship go to the ‘Photo Gallery’ tab on the Home page and select ‘2014’ from the drop-down.